At its best, architecture can shape identity. This is certainly the case in Geneva, NE, where a beautiful town center is rowed with historic buildings from the first quarter of the 20th Century. Many of these buildings evoke the Arts and Crafts design movement and all of them have unique character. In designing the Fillmore County Hospital, Health Facilities Group quickly realized that Geneva’s architecturally inspired identity already contained the blueprint for a hospital that would truly belong to its community. Designing and planning the 57,599 SF Fillmore County Hospital in Geneva, KS involved meeting client-specific construction needs. To accelerate the project timeline and reduce construction costs, pre-cast concrete was used for an exterior shell finished with a thin brick facade. Additionally, Health Facilities Group's design left space for growth in three directions to accommodate potential future expansion. Fillmore County Hospital has 20 acute care beds, two of which are dual purposed as labor and delivery or sleep study rooms; an 8-provider clinic, specialty clinic, speech therapy services, and radiology and emergency departments. The hospital also has a specialty in physical and occupational therapy. Helping our client best serve these PT/OT patients required incorporating a large, six-person therapy pool into the design. Every project necessitates a different approach to the design and planning process. 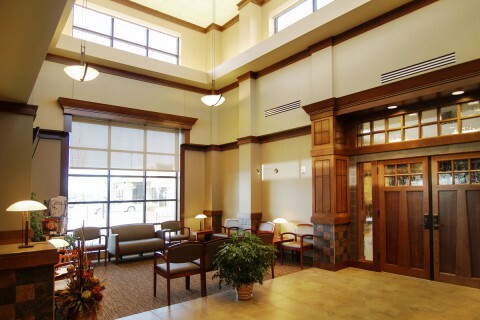 By listening to clients, architects can enhance hospitals’ capacity to facilitate healing.